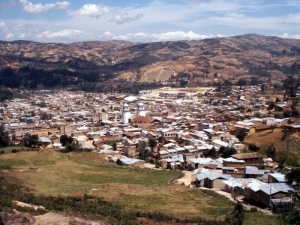 The city of Cajamarca is a wonderful tourist destination. Bordered by Santa Apolonia hill. It is considered the Historical and Cultural Heritage of the Americas, was transformed by the Inca Empire into an important administrative, military and religious center. On November 16, 1532, Cajamarca witnessed a key date in the history of the Americas, when a band of Spanish soldiers led by Conqueror Francisco Pizarro took Inca ruler Atahualpa captive. The city reflects Spanish influence in its architecture, such as the Cathedral. Built in the 17th century, it has an imposing facade, decorated with striking volcanic rock inlay and an interior of finely detailed sculptures. The churches of San Francisco.” The church was built in 1687 and is uniquely adorned by trumpeting angels the churches of La Recoleta, San Jose and La Belen – with its tastefully painted yellow, red and blue statues and beautifully carved stone frontispiece- are all well worth visiting .To the east of the city are the Baños del Inca, the natural hot springs which the Inca ruler was fond of. 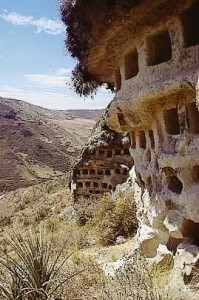 The district also features the Ventanillas de Otuzco, a complex of burial caves carved out in pre-Inca times. 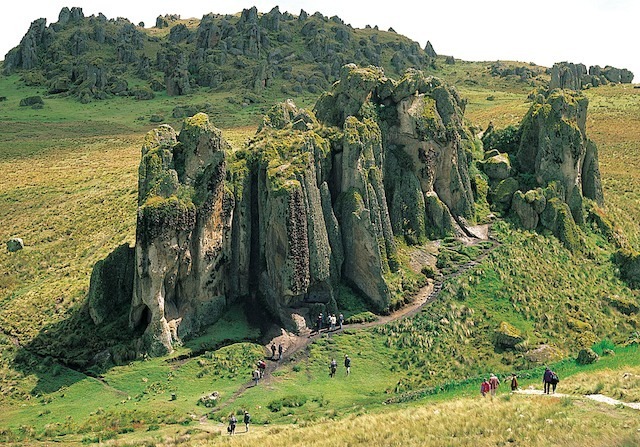 The province of San Pablo is home to two major archaeological complexes: Cumbemayo, a set of ceremonial altars and Inca aqueducts,Kuntur Wasi, a ceremonial complex of several squares and platforms held up by huge stone walls. 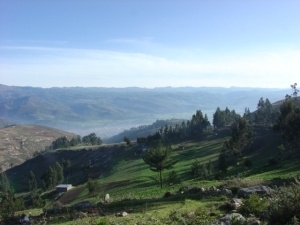 North of the city is Granja Porcón, a dairy farm where travelers can take part in farming chores. The farm is famous for its herd of cows which are still called by name at milking time. The Incan Baths are possibly Cajamarca’s foremost tourist attraction. The specially-built pools allow hot sulphur-bearing water to mix with cool river water evidence of famed Inca engineering. Visitors can still relax in the warm baths, where the water bubbles up through the stone bottom. The best-known thermal springs in the Baños del Inca are El Tragadero and Los Perolitos – The Drain and The Little Pots, respectively – where the water is hot enough to boil an egg. Visitors can comfortably relax in less scalding pools there at a temperature of 25 degrees Celsius (77 degrees Fahrenheit).The countryside surrounding the baths is spectacular. Much more impressive, however, is the Cumbe Mayo Aqueduct, which starts from Cumbe Bluff, 20 kilometers from the city. Built 3,600 meters above sea level, this hydraulic engineering feat continues to stun scientists, not only because the water channels are carved from rock, but also because they run in zigzag fashion at perfect right angles, apparently to reduce the speed of the water flow. 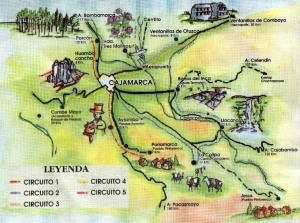 They also reverse the naturally flowing current to the Pacific back toward the Atlantic until it reaches Cajamarca. Despite running downhill at a steep angle, the water bubbles along at a gentle pace. Locals claim that the petroglyphs and carvings at the site depict tunnels that run as far as Cusco.